"Mina föräldrar bor i Storbritanniens huvudstad." Translation:My parents live in the capital of the United Kingdom. Will try to fix the sentence asap, and thanks for the heads up!! I agree. In Swedish Storbritannien could be either the state United Kingdom, or the island Great Britain. But the United Kingdom doesn't have a capital city :p it's a collective of countries, each with their own capital. London is the capital of England. If you asked a Scottish person if their capital was London they would definitely say no. Edit; in fact I just looked it up and according to Wikipedia, London is the capital of the 'UK'...but even to me as a native English person, that makes no sense haha, maybe I'm wrong but it seems weird :S. Then again, I never consider myself 'British'. Hmm, maybe you can leave it as is then. I mean it’s complicated, but the UK is also a country, it’s not a union like the EU or anything like that. It’s an official sovereign state with an official capital, and it consists of four countries with capitals of their own. From our point of view, it is important to speak about Storbritannien because otherwise we very easily say England when we in fact mean the whole United Kingdom. It's strange to consider as a native as it's not something that I ever even think about. Yes you're wrong :P. London is the capital of the United Kingdom. Scotland is a region with a degree of autonomy within it, but it's still subordinate to Westminster. I only really consider London the 'political' capital of the UK due to parliament being situated there. Culturally though, London is only really the capital of England. I'm pretty confused. For me (native spanish speaker from Dominican Republic haha), people from England are '' english '', people from United kingdom are ''english'' too, and the people from Great Britain are '' British '' and here I see that the two are the same thing. Could someone explain clearly how they are called everyone in Swedish? I can't help you with the Swedish demonyms, but I would like to point out that not all people from the United Kingdom are English. The UK is a collection of four countries (England, Scotland, Wales, and Northern Ireland). England is by far the most populated, but if someone comes from the UK, then they're from one of those four countries (unless they want to include crown dependencies, like the Isle of Man). People from Great Britain are called British, or Britons. In all honesty, of all those people I've met (in Australia), only the English seem to refer to themselves as British, or from the UK. The Scots, Welsh and Irish generally refer to themselves as Scots, Welsh, or Irish. Jewgoslav, I don't refer the english way but the swedish way. I just meant the way we call them and the way i have to call them in swedish. Fair enough. My bilingual dictionary has arrived, and it has a few of the demonyms, but it does not have United Kingdom. Google translate came up with Förenade kungariket, but I don't know whether that refers to GB and NI specifically. I found a few websites that say so, but others use Storbritannien. However, my dictionary does say that British is brittisk, that a Briton is en britt, and that Ireland/Irish is Irland/irländsk. I hope you find that more helpful than my last post. Probably due to historical and political oppression. Many Irish, Welsh, and Scottish people want independence because of the control from westminster and lack of devolved power. In English it is seen as important to be distinct with these 2 due to Ireland. 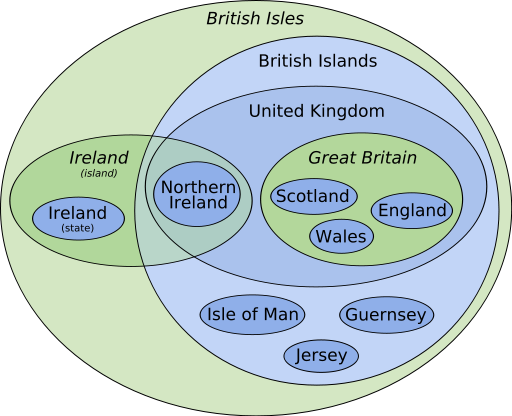 Obviously Ireland is not in GB but is in the UK, however sometimes people from northern Ireland are referred to as British. However, many people from Eire would be offended to be considered British, or as part of the UK. Northern Ireland is Nordirland, https://sv.wikipedia.org/wiki/Nordirland, also Ireland is Irland and Scotland is spelled Skottland, the rest seems to be self-explanatory. Is "Storbritanniens" the common usage? I mean, in everyday speech almost nobody says "United Kingdom" or "Great Britain". One just says "Britain". Yeah, it’s common usage. Colloquially it’s quite common to say England to refer to the entire UK, but obviously this is considered incorrect by many. If Storbritannien means United Kingdom, then what would you say if referring to the island of Great Britain? So ... the Swedish language doesn't differentiate between "United Kingdom" and "Great Britain"? Right. They're both Storbritannien to us. Why is "My parents live in London" not accepted? Because it's not a translation of the phrase. Tell that to a Scotsman. Ask a scottish person if their capital is london and they will say no, its glasgow. OK, Glasgow is the capital of the United kingdom. I don't think it works that way, the Scottish are very proud of their nation and if someone told them that London was their capital, they just wouldn't be happy about it. They consider Scotland as unofficially independent, but London is the official capital of both England and Scotland, and of course the rest of the UK. It's simply the case that the Scots don't like it when they're told they're ruled by England. I was pointing out the relationship between your comment and the actual sentence in the course. True, I forgot about Edinborough.